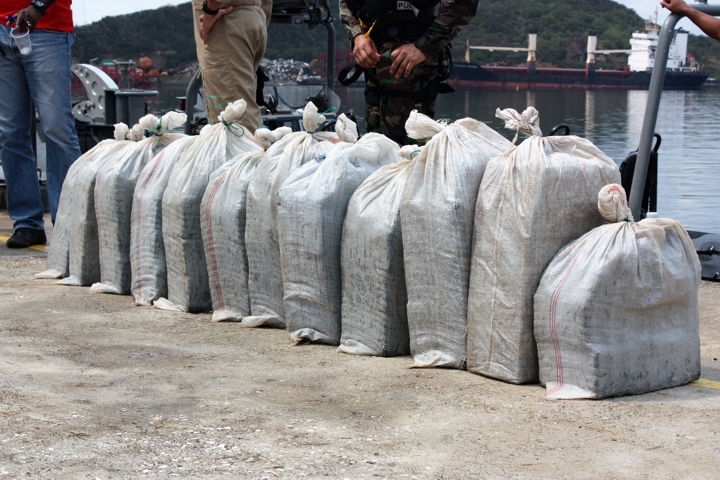 A whopping 600 kilogams of cocaine was intercepted by the Coastguard to the North East of Bonaire. Kralendijk- The Coast Guard together with the Dutch Marine ship Zr. Ms. Zeeland have dealt a severe blow to drugs smugglers when they caught no less than 600 kilos Cocaine which was being transported with a ‘go-fast’ vessel to the North East of Bonaire. The drug bust was the result of a Coast Guard Dash-8 surveillance plane noticing suspicious movement in the vicinity of Bonaire. The Zr. Ms. Zeeland was actually on her way back to The Netherlands, when they were alarmed by the Coast Guard. The marine ship shifted its course and encountered the go-fast with three suspects on board. The Zr. Ms. Zeeland instantly deployed her NH-90 helicopter and both interceptors. The helicopter released warning shots in order to force the go-fast to stop. The occupants of the go-fast started to throw their suspicious cargo overboard. The ‘go-fast’ was stopped by taking out the outboard engines. In a subsequent search, a total of 12 bales with approximately 600 kilograms of cocaine was retrieved. The crew of the go-fast has been taken on board. According to the Coast Guard, the’go-fast’ was not seaworthy anymore and was then sunk. The Zr. Ms. Zeeland headed to Curaçao and the suspects and the intercepted drugs were transferred to the local authorities. Then Zr. Ms. Zeeland has in the meantime continued its journey to the Netherlands.